EVEN though the CFMoto 650TK is a learner legal motorcycle it looks almost too big to be a LAMS machine. At first glance it reminded me a lot of Honda’s ST1300 in appearance. My initial impression was the overall look was very impressive and the bike would blend into the pack if parked amongst other larger capacity touring bikes. It has high ’bars and screen with a clear view of the instrument panel. 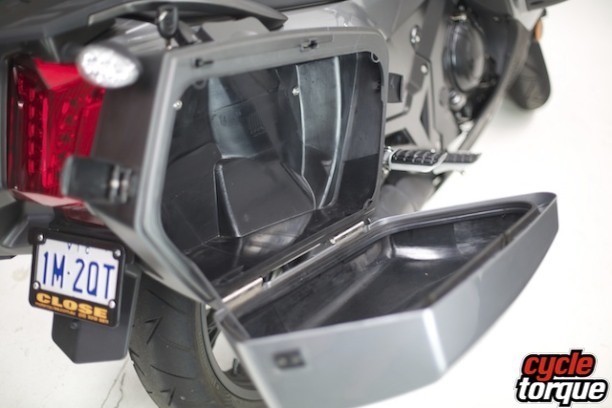 There are two small glove boxes situated on either of the fairing, one of which is lockable. The bike is also fitted with colour matched panniers which both integrate well with the style of the bike and have plenty of room. I could easily fit a helmet inside them. 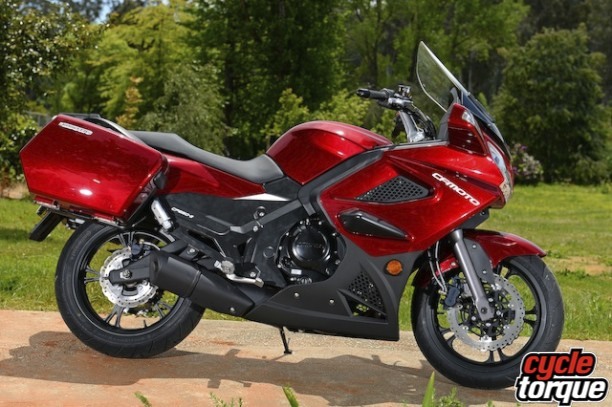 So, even though it’s a budget machine it has the equipment many touring riders look for. Sure, it doesn’t have the electronic gadgetry we may be used to these days but for a high number of touring riders out there I think it would do quite well. Getting on the TK the first thing I noticed was the bike felt lighter than it appeared and found it quite easy to manoeuvre around, but before I rode the bike I could see the riding position was designed around covering some decent miles. While I had no issues with room, I feel taller riders might touch their knees against the fairing. I found you also had to look down to see the mirrors, however on the road I found that while this was still the case, I soon got used to them and noted that they gave you a very good overall view of both beside and behind the rider. The light weight I felt pushing the bike around the shed transferred to the road, with the bike feeling much lighter than the 220kg weight would suggest, and it felt well balanced, nimble and responsive around town. The front suspension felt a little bouncy around town but once I got onto the outer roads it seemed to settle down and never had any further issues with it. During the two weeks I had the bike, I took it on a variety of roads and surface conditions including dirt. I found that the suspension was very good, soaking up even the worst bumps on some of our very ordinary roads and the front suspension which I had at first thought felt bouncy actually came into its own on this type of road, handling the bad surfaces better than most bikes I’ve ridden. The bike’s engine power was very good for a LAMS bike but the engine didn’t like to be taken below 3000 rpm. For acceleration 4000 rpm onwards was best and despite having a 10,000 rev limit at no stage did I feel the need to take the bike past 6000 revs. At highway cruising speeds I noted the bike’s engine was surprisingly low revving and seemed to be hardly working at all, so that sort of gearing straight up tells you it is a true touring bike not something cobbled up with a fairing to make it look like one. The bike’s exhaust note was extremely quiet and whilst I don’t like excessively loud exhausts I thought that in this case it could actually be a little louder. Panniers offer good luggage capacity and seemed solid enough. On a ride with friends some of my fellow riders made comments about the bike’s good looks and couldn’t believe how cheap the bike’s price tag was, saying it sounded like a bargain for what you were getting. Fuel wise I found the bike very frugal with the worst consumption figure coming in at 4.1lt/100km whilst the best was 4.5lt/100km. This would potentially give the bike a range of 386km which I found impressive. I put this down to the low revving nature of the bike’s engine. Of course if you ride it hard the fuel figures wouldn’t be so wallet friendly. Fit and equipment was good but I did find a couple of small things. The glove boxes in the fairing worked well but they appeared to be starting to bend slightly, I suspect due to the heat. To fix this they would either need to be made from a more rigid plastic or have a metal backing plate on the inside for extra support. As for the panniers I noted they had a locking handle in the middle and I believe that this alone would be adequate to hold them shut. However they also have secondary clips at the front and back and on numerous occasions after having ridden the bike, I found that the rear clips had come undone. This I believe may have been due to the positioning of the tabs they latch to being slightly off and causing to much pressure on the clip. While the instruments were easily seen I found that the speedometer display had fatter looking indicators for the numbers and at first I found myself double checking my speed. Once I got used to the speedometer’s numbering style this no longer bothered me and had no more problems with it. The 650TK is a fairly new model and I suspect small issues like this will be taken care of quickly, and some of them disappear anyway with longer term ownership as you get used to/sort the idiosyncrasies of the bike. Whilst I didn’t have the bike long enough to know anything about reliability issues, I did note that the bike has already gone into the Guinness Book of Records for the ‘Longest Journey in a Single Country’. Two travellers, Buck Perley and Amy Mathieson travelled 29,500 kilometres on a 131 day journey through every province in China to beat the previous record. The pair stated that during their trip they couldn’t fault the CFMoto 650TK and that the only thing the bike required was a couple of tyres. Considering the bike is learner legal I found the bike fun to ride having no troubles in any conditions. The bike has a comfortable riding position and the suspension worked well soaking up anything the roads threw at it. I only wish this bike had been available when I was getting my Learners Permit. It has plenty of room and despite its weight has quite good acceleration even when carrying extra weight I could not fault the bike. For the average teenager newbie they will find the CFMoto 650TK more than adequate and even a more mature beginner will find it a fun bike to ride with all the room they could ever want. 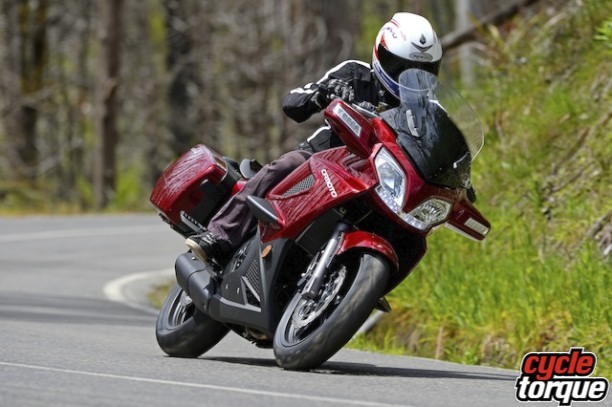 I also note that until the 31st March, 2014 CFMoto Australia is offering customers who purchase a CFMoto 650TK a FREE CFMoto Rider Jacket and 3 Year Factory Warranty. This along with a class leading 41.5KW (LAMS) of Power, great fuel economy and low price of $6,990 + ORC makes for a fantastic deal.